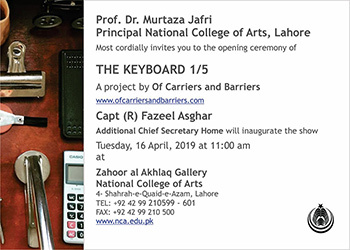 Principal NCA Prof. Dr. Murtaza Jafri cordially invites you to the opening of the exhibition “THE KEYBOARD 1/5”. This is a project of Carriers and Barriers. Capt (R) Fazeel Asghar, Additional Chief Secretary Home will inaugurate the show on Tuesday, 16th April, 2019 at 11:00 Am at Zahoor Ul Akhlaq Gallery, NCA. 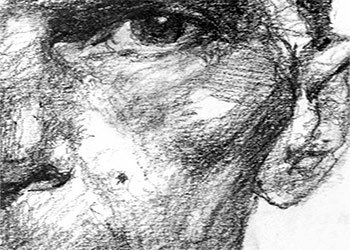 A talk on the works of Zahoor ul Akhlaq’s art practice and as a teacher by Ali Raza (Visual Artist) on Thursday, 7th March 2019, from 3pm till 5pm in the NCA gallery. Please join us for this informative session. An exhibition PRESERVING LEGACY by Prof. Saeed Akhtar (Sitara-e-Imtiaz & Pride of Performance) on occasion of 79th Pakistan Day Resolution was held today at Zahoor Ul Akhlaq gallery NCA. Honorable Chief Guest, Governor State Bank of Pakistan Mr. Tariq Bajwa inaugurated the ceremony. The show will remain open till 10th April.